Even the spice-merchants of old told of the indescribable beauty of Serendib, as they baptized the island at that time. Later on, Zelianor and Seilan; the British finally gave the paradise island 29 km southeast of India the name Ceylon. Today, the Singhalese call their country proud Sri Lanka, the royal-luminous country. No other country in the world offers such a variety in such a narrow space. Nature is a true masterpiece: mountains that vary in color, pastel green and deep blue in accordance with daylight, gushing waterfalls and broad rivers, broad plains and dense forests, hills full of tea plantations and reister terraces, an enchanting plant world, palm-lined dream beaches and breathtaking lagoons. Everywhere you can find witness to the rich culture and history of the country: historical temples and monuments. But the most impressive of all the treasures of the island are their always friendly inhabitants. The country's life, nature and climate are responsible for a particularly open and accessible nature. Hospitality is the top priority. In the Indian Ocean 6-10 north latitude and east longitude 79-82. The population of Sri Lanka has over 20 million inhabitants. The majority of them are Sinhalese (74%). The remaining part is made up of Sri Lanka Tamils ​​(12.6%), Indian Tamils ​​(5.5%), Moors, Malays, Burghers (Portuguese and Dutch descent) and Others (7.9%). Most of the inhabitants are Buddhists (69.3%). Other religious communities are Hindus (15.5%), Muslims (7.6%) and Christians (7.5%). The country is characterized by religious freedom and tolerance. The literacy rate of Sri Lanka is 88.6% one of the highest in Asia. 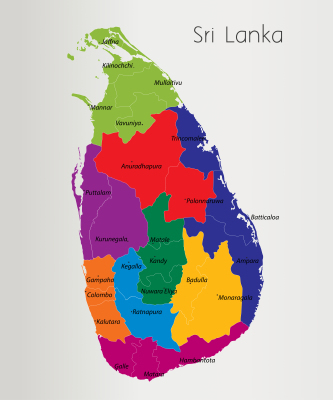 The official country languages ​​are Sinhala (Sinhala) and Tamil. English is widely spoken and understood. Place signs and signs are usually in all three languages. The Democratic Socialist Republic of Sri Lanka has been an independent and sovereign nation since 1948 and consists of several provinces. Legislation is exercised by Parliament, the highest executive power is the President, elected by the people. On December 26, 2004, Sri Lanka was haunted by a terrible natural disaster. A tsunami destroyed large parts of the country. After the tsunami waves, another, but much more positive wave came on Sri Lanka, an enormous donation wave from all over the world. - for 2 family houses were built on own property outside the 100m border. It is necessary that the donation projects are sustainably promoted. More information about our projects can be found here. Should you have any questions or would like to participate, please contact us by e-mail.